This casual three-piece sectional combines plush comfort with livable style, allowing you to appoint your living room with furnishings that are simultaneously fashionable and functional. Broad rolled arms, deep cushions and ultra-plush upholstery fabrics combine for casual style that the whole family will enjoy. A left-facing sectional sofa, armless love seat and right-facing chaise offer ample seating space for quiet nights in or gatherings with family and friends. The Vista - Chocolate Casual 3-Piece Sectional with Right Chaise by Ashley Furniture at AHFA in the area. Product availability may vary. Contact us for the most current availability on this product. 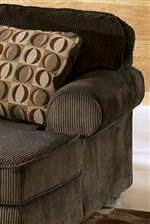 6840466 LAF Sofa 1 92" 38" 36"
6840434 Armless Love Seat 1 64" 38" 36"
6840417 RAF Corner Chaise 1 41" 62" 36"
Fabric Options Chocolate fabric upholstery. Leg or Skirt Tapered wood block feet. The Vista upholstery collection brings a calm, casual look to any living room decor while giving you the plush comfort you deserve. Deep cushions, broad rolled arms and luxurious textured upholstery fabric in Chocolate combine to create sectional sofas that are casual in both comfort and style. Ideal for your family room or home theater, this versatile collection includes a cocktail ottoman that can be used as a footrest or in place of a traditional coffee table. Enjoy the enhanced comfort and style of the Vista collection in your home for years to come. 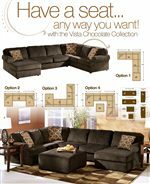 The Vista - Chocolate collection is a great option if you are looking for Casual furniture in the area. Browse other items in the Vista - Chocolate collection from AHFA in the area.